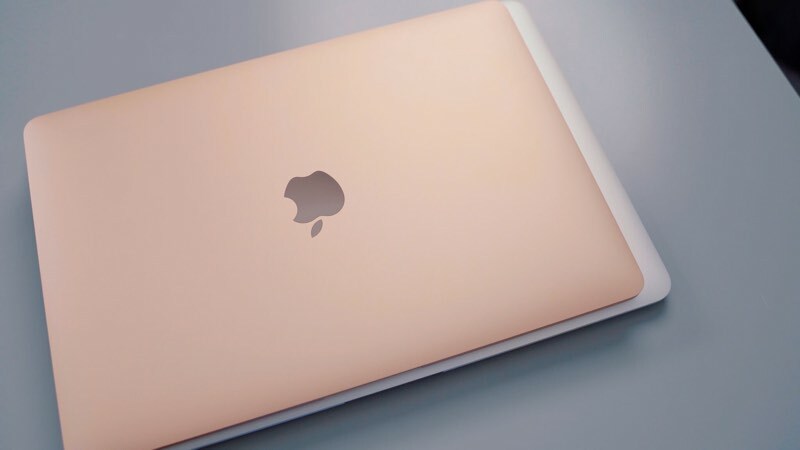 Apple in October gave us a major surprise with the launch of an entirely revamped, updated version of the MacBook Air, its most popular and affordable notebook option. 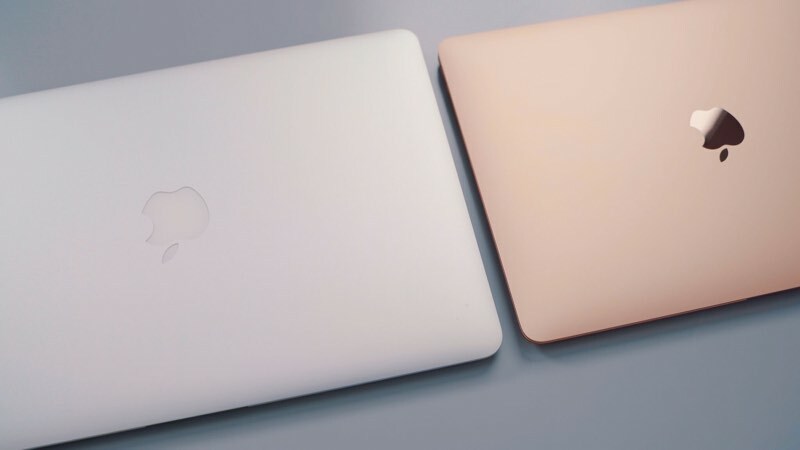 We went hands-on with the MacBook Air last week, and this week, we picked up an older MacBook Air to compare the new model to see just what's different and whether it's still worth buying the old version, which sells for $200 less than the current model. 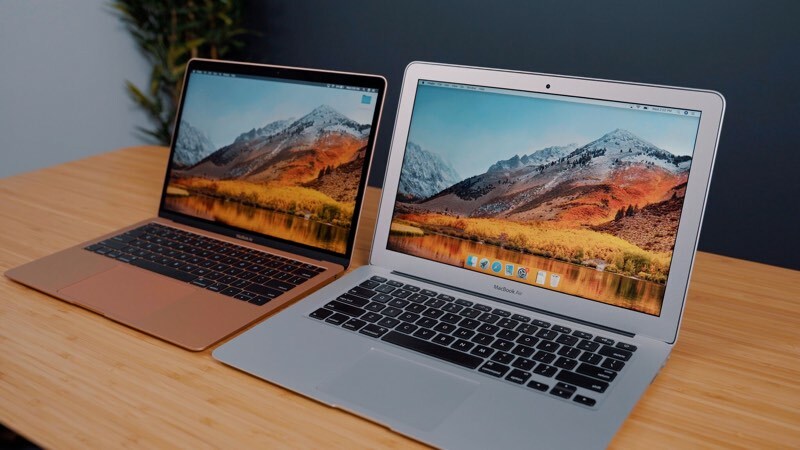 The previous-generation MacBook Air is a 2015 design, but in 2017, Apple introduced 1.8GHz Broadwell-generation chips that were a slight upgrade from the 1.6GHz chips the machine had previously used. No other changes were made, so technically, Apple's old MacBook Air is outdated by several years. 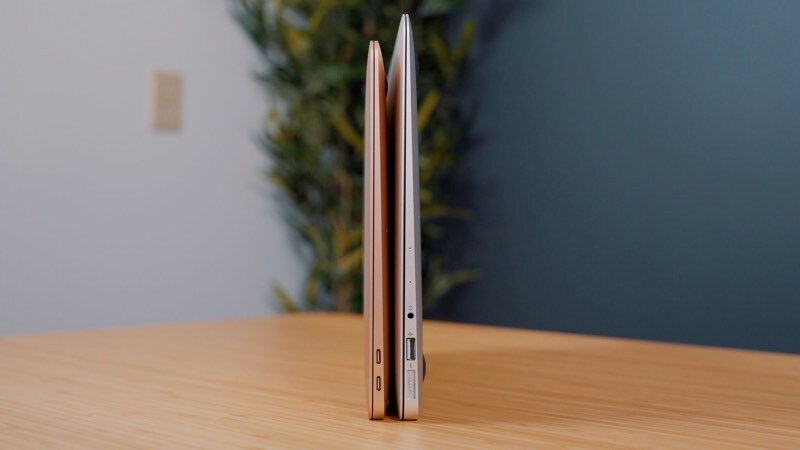 Design wise, the new MacBook Air features a smaller, slimmer body that weighs a bit less, and the slimmer design is noticeable. It continues to feature the same tapered design as the previous models, and we didn't think the weight difference of a quarter of a pound stood out. Along with a slimmed down body, the new MacBook Air comes in three color options: Space Gray, Gold, and the traditional Silver. Space Gray and Gold are colors that are new to the MacBook Air lineup. The biggest change to the 2018 MacBook Air models is the display, which is now Retina and a huge improvement over the low-resolution display in the previous MacBook Air. The MacBook Air used to be the sole Apple device sans at least a Retina display option, but now Apple uses higher-resolution displays across its entire product lineup with the exception of the entry-level 21.5-inch iMac. We thought the MacBook Air's new display offered a significant improvement over the previous MacBook Air's display, but it doesn't quite measure up to the display of the MacBook Pro because it's just not that bright. Brightness can be an issue outdoors in sunlight, so that's something to be aware of. Design wise, the front of the MacBook Air has been overhauled. Those thick silver bezels from the previous version have been replaced with sleek, slim MacBook Pro-style black bezels that look much, much nicer. Several other MacBook Pro features have been brought to the new MacBook Air and are upgrades over the previous model. There's a larger Force Touch trackpad, a third-generation butterfly keyboard, better speakers, a Touch ID button for authentication purposes, and a T2 chip for improved security. Inside, the new MacBook Air is sporting a 7W 8th-generation 1.6GHz Intel Core i5 processor, and unsurprisingly, it's much speedier than the three-year-old processors used in the prior MacBook Air. Apple used to use 15W chips in the MacBook Air models, but this new, lower power 7W chip is both fast and efficient, allowing for longer battery life than ever. The last super notable change is to the port setup. The new MacBook Air has two Thunderbolt 3 ports and a 3.5mm headphone jack, with Apple eliminating the USB-A ports and the SD card slot from the older model. The addition of Thunderbolt 3 brings the MacBook Air in line with the rest of the Mac lineup and allows it to connect to 4K and 5K displays, faster Thunderbolt 3 storage, eGPUs, and more. All of these changes have raised the base price of the MacBook Air. Prior to the October update, the MacBook Air sold for $999, but now the base model sells for $1,199, a $200 premium. Given the scope of the revamp, the $200 upgrade fee is well worth paying for anyone thinking of purchasing a MacBook Air. Apple is still selling the older model at the same $999 price point, but it's just not worth purchasing because the components are so outdated at this point. What do you think of Apple's new MacBook Air? Let us know in the comments. I just find it ironic that Apple sells laptops that won't even charge an iPhone right out of the box without purchasing an adapter. No glowing Apple logo. Dongle required for media card and anything USB. Bad keyboard. That's a lot of negatives. I haven't yet decided if I'm buying anything. My MacBook Pro 2017 (work) is fine, asks my 2012 Air is still doing what it can with 4Gig Ram. Note: As someone pointed out, I forgot to mention MagSafe. Losing that is another big negative. Would still buy the old one. Still not updating my 2011 13” MacBook Air. I need 256GB and the upgrade of $200 is criminal. Don't forget the loss of the magsafe! That has to be the dumbest thing I have ever seen this company do! Please stop justifying price increases just because a computer is updated. How can you justify a 20% price increase for the same product? Also, it has lower-end Y-series processor instead of the U-series that it should have. When the iPhone 5S was released it included TouchID, apart for improved processor, etc and the price remain the same! Until the last two years each product Apple updated kept its price as do other manufactures. Do you remember when Apple released a new product, kept the price and doubled the storage? Nowadays you’ll justify that if the base storage is higher, the base price should be higher. In my real world use, the old Macbook Air (i7, 8GB RAM) was more efficient on battery and felt less sluggish than the new one. I think the main problem is the crappy Y-series processor powering the retina display. Real world I'm getting 6 hours of battery life. I would get 7-8 at least on my old one. Switching between tabs on Chrome for example is very sluggish on the new machine. Ultimately I doubt this thing is going to last 5 years so I've got a return label ready to go as soon as my tbMBP replacement arrives. Lot of negative comments here. Some from people who bought one, used it for a while, and returned it. Respect. But many from people who just want to trash it. Ask people who own one, who've spent more time with it than someone who saw it in a store. I bought a 2018 MB Air a week ago to replace my early 2015 rMBP. I used the rMBP in all kinds of lighting conditions (though not so much outside) and I never found it wanting for brightness. I did a side-by-side comparison of the new MBA with my rMBP and the MBA display is every bit as bright as the rMBP's display (both are rated at 300 nits). Also, the colors are not washed out or otherwise any less pleasing than the colors on the rMBP. I am happy with the display. Sure, it's not as nice as the display on the 2018 MBP with Touch Bar, which has True Tone. But that computer is a lot more expensive than the MBA. Some are complaining that the 2018 MBA doesn't have mag safe or the glowing apple logo. But neither does any MacBook or MacBook Pro launched in the past couple of years. Some are complaining about the replacement of the almost universally loved chicklet keyboard with the divisive butterfly keyboard. Again, all current model MacBooks have this. I loved the previous keyboard, too, and thought I'd hate the new one. But after using it for a few days, I don't mind it at all. Some are complaining about the need for dongles or USB-C hubs. I am living with this thing now and, at least for me, a single hub is all I need (the Satechi hub with USB-C pass-through, 3 USB-A, ethernet, SD-microSD card, and 4K HDMI). Carrying it around is no trouble at all. Performance is absolutely fine for me. The fan can be noisy but it rarely comes on. Battery life exceeds my rMBP, which is partly because that computer (and its battery) is 3 years old. But I never got more than 6 hours on that computer, even when new, and I'm easily getting 8 on the new MBA. The new MB Air isn't for everyone. The MB Pro w/o Touch Bar will be a better choice for people who need more power, and for people who don't think the new Air's screen is bright enough. But the Air is a good purchase for some of us. For the rest of you, there are some great options for you. I won't criticize your choices because you know what's right for you, not me. A chrome, that explains it. Right because Safari performs so well lol.